La note a été taggée Bandai, Pippin. For Christmas 2015, I got a treat: a complete Pippin, within its box. A what ? 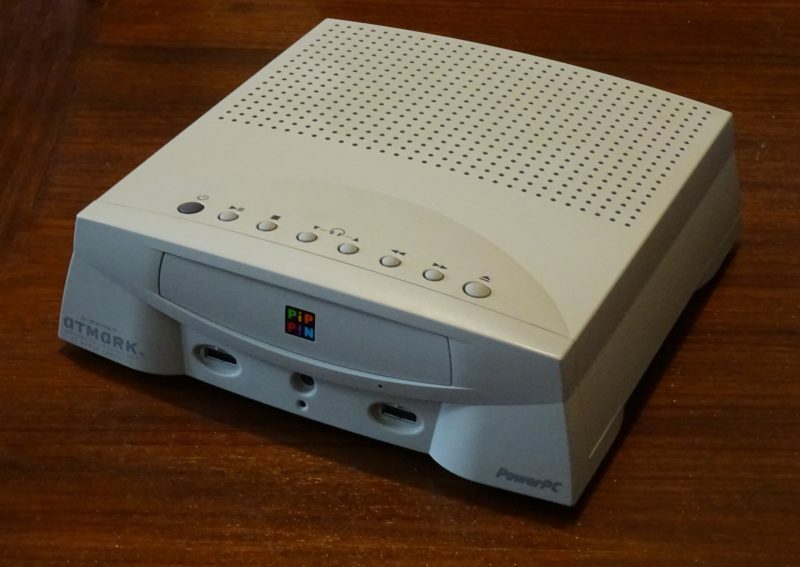 A Pippin, an Apple console released in 1995. 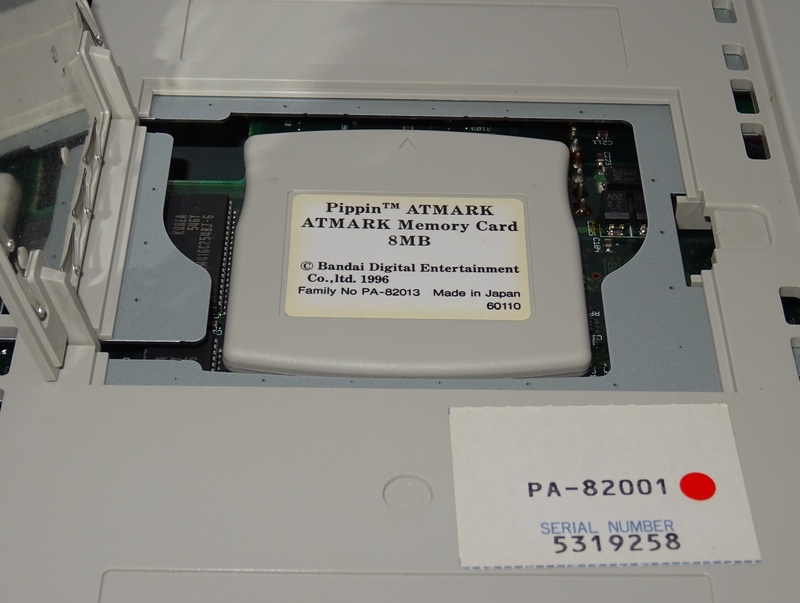 The console is a japanese Atmark (white), with its modem and its AppleJack gamepad. A reader (who will recognize himself) gave me some convenient accessories: a 4 MB memory card (RAM) and some adapters for the P-ADB connections. The front of the console offers three outlets: a 3.5mm jack and two P-ADB outputs. It is simply reinforced ADB ports to simplify the connection and avoid breaking the pins. 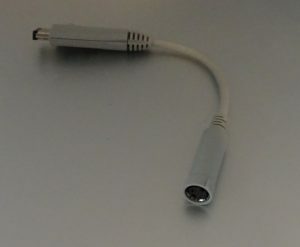 Passive adapters allow to go from one outlet to another and the P-ADB is chainable, as the ADB. The front of the console is also adorned with buttons to control playback, volume, and turn on the console. The rear of the console, in addition to an IEC socket for the internal power supply, offers a lot of things. First, three video outputs: S-Video, composite and VGA. The first two come with either PAL or NTSC (576i or 480i), and the VGA 480p. 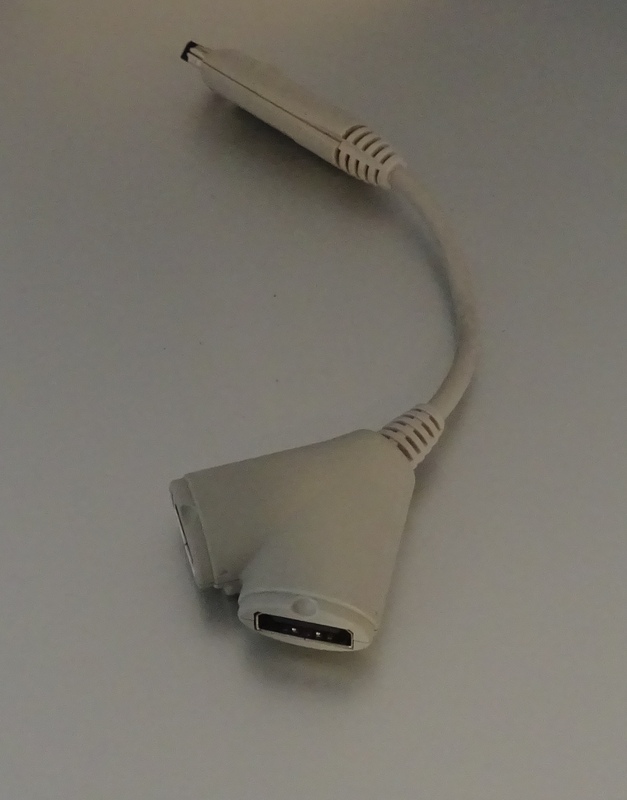 VGA is still obviously the best choice if your TV is compatible (in the worst case, an old screen can do the job). The console also features audio inputs and outputs in RCA, in addition to the jack on the front. Finally, two Mini DIN series outlets (classical for Apple) complete the deal. 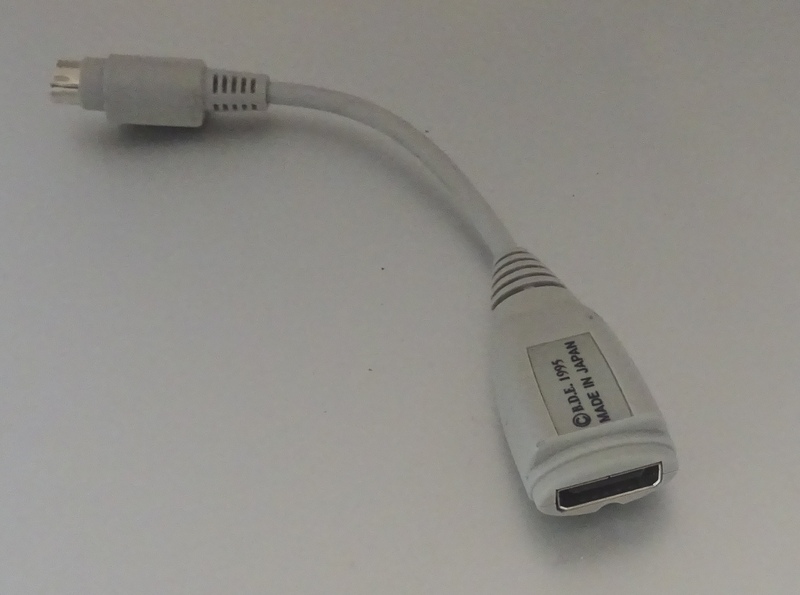 They are used for the modem but also possibly for the LocalTalk (but not for the default system). Some consoles also feature an external SCSI connector, but not mine. The console itself is based on a PowerPC 603 at 66 MHz, with 6 MB of RAM and an internal flash memory of 128 KB. Apple has included an expansion slot under the console to add RAM, with cards of 2, 4, 8 and 16 MB. When I tried to install a 4 MB card lent by a reader, I found a card 8 MB already installed. Some games may benefit from that, even if it is pretty rare. I have three interesting adapters: the first one can double an P-ADB connector, the second one can connect a standard ADB device on the console (keyboard, mouse, etc.) and the last one an P-ADB device on an ADB port (on a Mac). 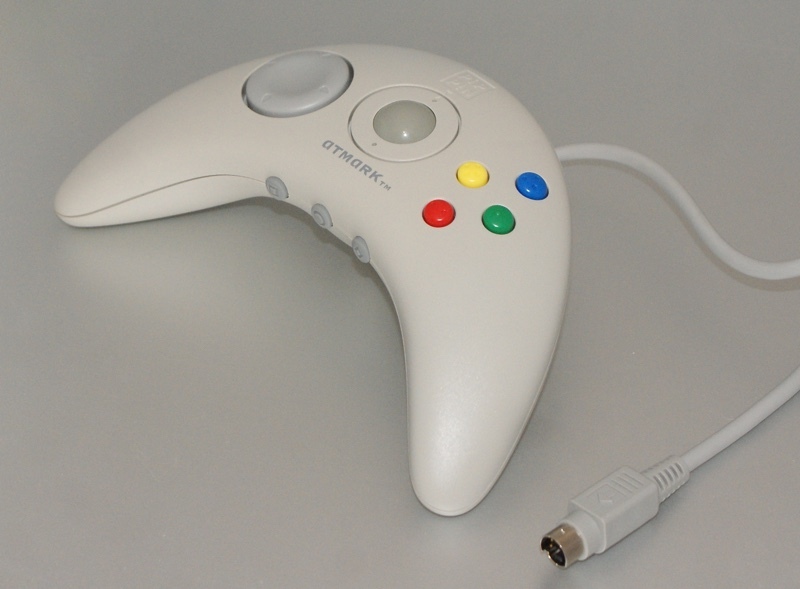 The gamepad is exactly the same as the one I have with ADB (in french). It is not very ergonomic nor practical, but the trackball remains a good idea in my opinion. If you want to see the games, it will be for next time: I must try first to optimize my capture setup to achieve good results. And to be honest, it’s really terrible . If you want to play some games, then you may try under Mac OS. Moreover, a slightly annoying thing is to be noticed: the console is very noisy. See you later for weird games and stuff.